The World Curling Federation (WCF) Sweeping Summit held in Kemptville, Ontario, from May 24 – 26, 2016 confirmed that directional sweeping behaviours can be observed for a range of brooms that were commercially available during the 2015-16 curling season. Specifically, stones were observed to curl excessively to the point of stones being swept off the sheet prior to arriving to the hog line. Athletes were capable of preventing a stone from curling, backing it up on its line and stopping a stone by sweeping perpendicular to the motion of the stone. All of these behaviours were identified in a stake holder survey in advance of the summit as behaviours beyond the scope of the sport of curling. 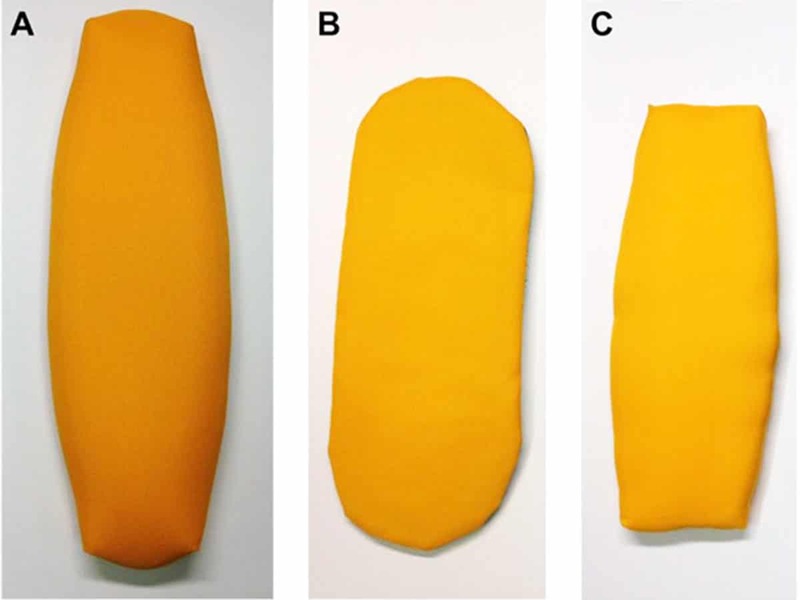 The athletes were able to identify a fabric, Nylon Oxford 420D (Figure 1), which they tested in a multitude of different situations and they unanimously agreed that the fabric did not exhibit any signs of directional sweeping (Figure 2). The results within this report suggest that the selected fabric does agree with the recommendations of the pre-summit stakeholder survey. The chosen fabric returns sweeping to the simplicity of cleaning a path in an effort to modestly drag a stone further and straighten the path of the stone. All athletes agreed that this material returns the primary responsibility for shot making to the thrower while continuing to maintain the relevance of the sweepers when the three standard head sizes were used. The impact of curling broom construction on performance was also evaluated with respect to the fabric, size of broom head, the addition of an insert or foil, and the type of foam used. Different types of Nylon and polyester fabrics were also evaluated. 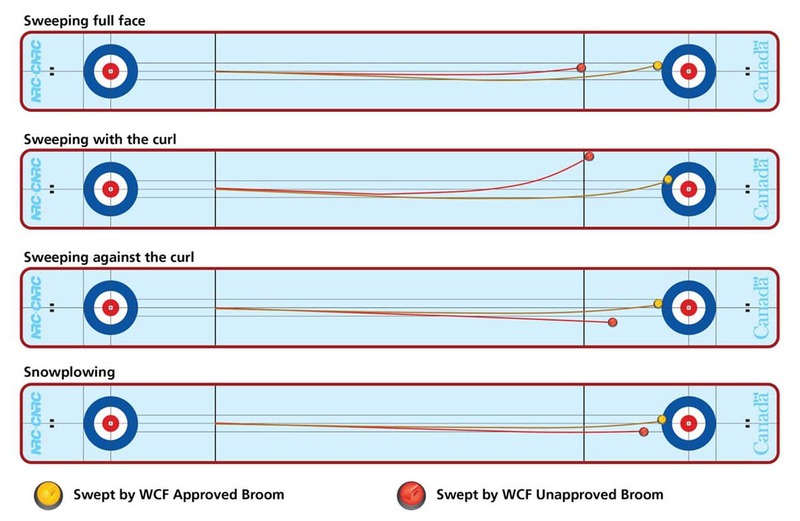 While most fabrics produced brooms that performed within the scope of the sport, TopGun polyester fabric consistently produced brooms that did not align with the WCF sweeping survey results. When examining the weight or denier of the fibers the data suggested that as the fiber becomes finer within the broom head it can drag a stone further down a sheet of ice, however, a larger dataset is required to draw a conclusion. While the orientation of the fabric weave was not found to have a significant impact on performance, colour was found to have a dramatic impact. Head size was not found to have a significant impact on performance when the athlete selected Nylon Oxford 420D fabric was used. In cases where other fabrics were used for the construction of the broom smaller heads were found to perform differently. In general terms, when fabric coatings were in contact with the ice the broom performance was not in alignment with the stakeholder survey. Foil inserts were acceptable when used on a standard oval head, but when the head size was reduced the foil was capable of producing a more aggressive broom. Similarly, inserts were consistently found to produce extremely aggressive brooms. The properties of all the foams tested from the summit were consistent with one another; however, when the foam was ridged it in general produced a broom that was not in alignment with the WCF survey. Based on the performance testing and the survey results it would be in the best interest of the sport of curling for outer fabric coatings, inserts, foil, and ridged foam to not be permitted in the construction of a curling broom for an elite player so the primary responsibility for shot making is left to the thrower.